Massive Fatberg Found Blocking Sewer In British Seaside Town The giant clump of fat, oil and wet wipes lurking below the town of Sidmouth measures 210 feet, making it 42 feet longer than the White House. It will take about eight weeks to break it apart. 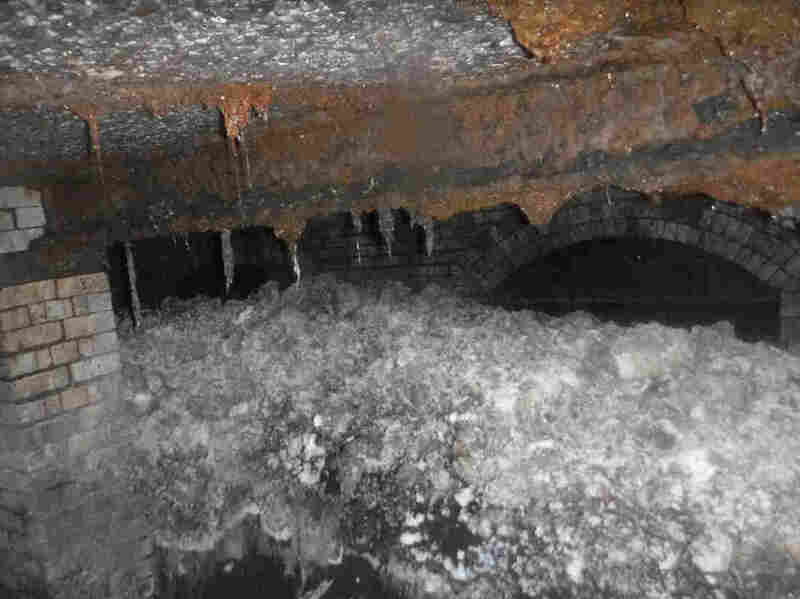 A fatberg measuring 210 ft. is blocking a sewer in the southwestern English town of Sidmouth. It will take a sewer team around eight weeks to dissect and dispose of the obstruction. They may not be new but they're always gross. A giant obstruction made up of hardened fat, oil, wet wipes and other waste items – called a fatberg — has been found in the sewer of a seaside town in England. While it's not the largest island of disgusting household waste to clog British sewage pipes, calling it a giant is not hyperbole. South West Water reports the monstrous clump lurking beneath the town of Sidmouth in Devon measures 210 feet, making it longer than the height of the Leaning Tower of Pisa, more than 13 end-to-end Hummer H2s and 42 feet longer than the White House. "It is the largest discovered in our service history and will take our sewer team around eight weeks to dissect this monster in exceptionally challenging work conditions," Andrew Roantree, South West Water's director of wastewater, said. It will take a sewer team using a combination of high-pressure jets and shovels and pickaxes to attack the fatberg, the company says in a statement. "It's the first time we have excavated a fatberg of this size and the confined space might mean it takes us a little longer or shorter," SWW explains. The removal will begin on Feb. 4, but could be delayed by heavy rain. Despite its size, SWW says "the fatberg has had no impact on Sidmouth's excellent bathing water quality and has been discovered in good time." But the utility company cautions "it doesn't always end this way," adding that every wet wipe and drop of oil poured down household drains could cause sewer blockages. According to the utility, it tackles dozens of new sewer blockages every day, which adds £4.5million – about $5.7 million U.S. — to bills every year. A 130-ton fatberg was discovered in London's East End in 2017. The massive chunk of congealed fat, oil, tampons and condoms elicited such widespread hathos – that is the attraction to something you really can't stand – that it became a huge draw when it went on display at the Museum of London last year. The "highly toxic" pieces of sewage were eventually added to the museum's permanent collection where they are being preserved "to fascinate and disgust future Londers" on a live "Fatcam." "Whilst on display the fatberg hatched flies, sweated and changed colour. Since going off display, fatberg has started to grow an unusual and toxic mould, in the form of visible yellow pustules. Our collections care team has identified this as aspergillus. Conservators believe that fatberg started to grow the spores whilst on display and now ... these spores have become more visible." For those whose hathos knows no bounds, you can still watch that here. In the U.S., a Baltimore fatberg caused a dry weather sewer to overflow and discharge around 1.2 million gallons of sewage into Jones Falls in 2017. "It was a good chunk of a city block," Jeffrey Raymond, communications chief for the city's Department of Public Works, told NPR. Workers had to deploy high-pressure water jet, a scraping device and a vacuum truck to remove the fatberg. "There's some back and forth in the industry as to what wipes are flushable, what wipes are not flushable. We, for the record, try to keep it simple. It's poo. It's pee. And it's toilet paper. If it's not 1 of those 3, it doesn't go down a toilet," Raymond said. Regardless of where one lives pipes are pipes and fat and oil will harden and cling to solid waste stuck in sewage systems. Raymond's advice is this: "Don't treat your toilet like a trash can."